Operation Barbarossa or Operation "Red Beard" was the Germans code name for the attack on Russia in June of 1941. Despite ignored warnings from the NKVD this attack comes at a complete surprise to the Russians. 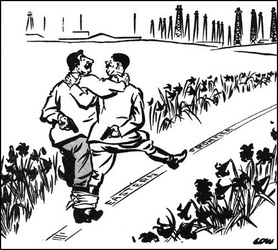 This breaks the terms of the Nazi-Soviet Non-Aggression pact. This takes place over a 2000 Mile long front. The Blitzkrieg tactics used by the Germans surprises the Red Army. The Nazi's are briefly seen as liberators. The Russian peasants begin the Scorched Earth Policy, thus burning all of their crops and shelters, making the Germans bring all of their supplies with them because there was no means of food otherwise. 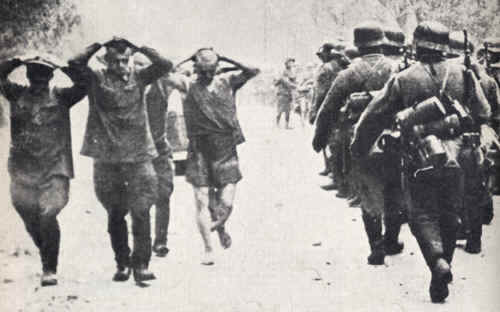 The Germans besieged Leningrad, they captured Kiev, they reached the Crimea, and were forced to halt 50 miles away from Moscow due to the Cold winter which the Germans were not used to. By the end of their attack Almost 2 million Red army troops had been taken prisoner.